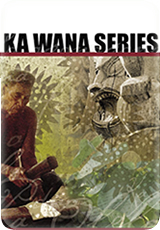 The Ka Wana series was developed through the Pihana Nā Mamo Native Hawaiian reading program. It offers new insight into the philosophy and way of life of Native Hawaiian culture. Those raised in these traditions will find memorable recollections, while those growing up without opportunities to know Native Hawaiian values and practices will find insights and guidance. The Ka Wana series consists of eleven short volumes covering a range of subjects including ethics and philosophy, leadership, education, health, management, protocol, and religious beliefs. Each volume is illustrated with historical documents accompanied by detailed cultural descriptions. There was a period in Hawaiian history when the literacy rates for Native Hawaiians, both children and adults, was higher than that of the United States. What happened and what can we learn from that situation in addressing the education needs of Native Hawaiians today? In A‘o, Educational Traditions, Malcolm Nāea Chun takes the reader through the fascinating story of how Native Hawaiians learn, why learning and knowledge were prized in traditional society, and how two systems, native and foreign, combined to achieve one of the highest literacy rates in the world. When confronted with the question, what is the greatest Hawaiian value?, researcher and scholar Malcolm Nāea Chun, after a very long period of consideration, decided it has to be pono. What about lōkahi, aloha, ola, mahalo, or other buzz words used today to describe Native Hawaiian values? In Pono, The Way of Living Chun explores why pono is the core value for critical Native Hawaiian thinking and decision making. He uses traditional and historical accounts to describe what pono means, how it was valued in traditional society, and the key role it has in modern Native Hawaiian society. Pono, The Way of Living is the first volume in the Ka Wana series and as such, presents the worldview of Native Hawaiians. Pono is about the importance of living a life of goodness. But what happens when that struggle is knocked out of balance? The cultural practice of restoring this goodness to what it once was is called ho‘oponopono, now a widely known and respected part of Native Hawaiian culture. But without the advocacy of Mary Kawena Pukui and the Queen Lili‘uokalani Children’s Center ho‘oponopono might well have been forgotten. Malcolm Nāea Chun traces the practice of ho‘oponopono back to the earliest traditional accounts, taking the reader on a journey through the practice’s acceptance in academic circles, and its institutionalization into health and social practices in modern Hawai‘i.